LIKE the Lady drawn in the Ist PLATE, we have thought to represent in this a man in half-mourning. We would have given one in full mourning in the eighteenth Issue; but we would not be able to say to have given a fashionable man. Here is how a very-great number of young people wore half-mourning. 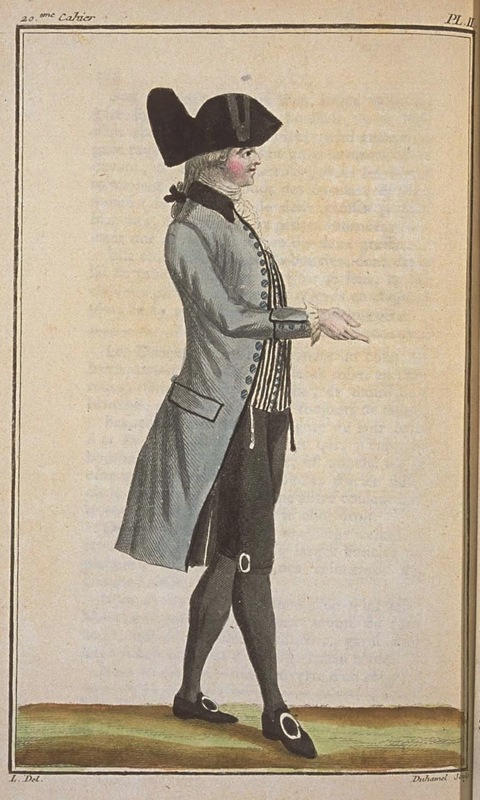 Black stockings and breeches; gilet of taffeta with wide white and black stripes; grey coat with collar of black velvet; black lining with piping; and striped, bronzed steel buttons. 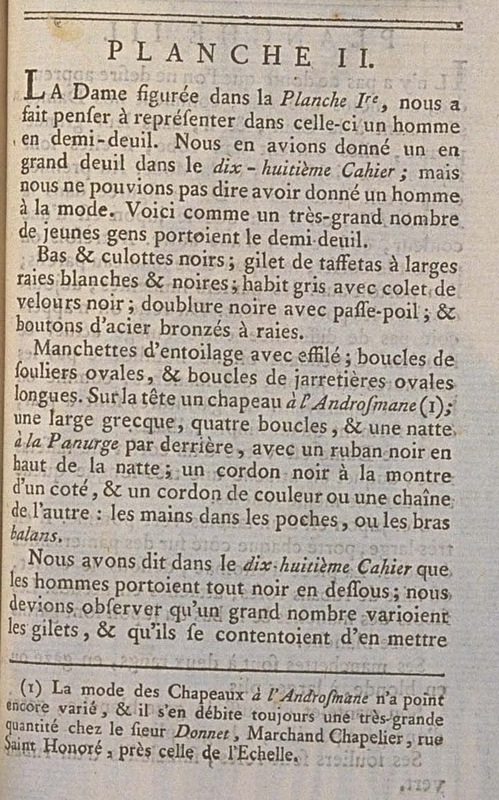 Manchettes of entoilage with effilé; oval shoe buckles, and long oval garter buckles. On the head a hat à l'Androsmane (1); a wide grecque, four curls, and a braid à la Panurge in the back, with a black ribbon at the top of the braid; a black cord for the watch on one side, and a colored cord or a chain on the other: hands in the pockets, our arms swinging. We have said in the sixteenth Issue that men wore all black below; we should observe that a great number vary their gilets, and that they satisfy themselves in putting where the black was at least as great a quantity of any other color which accompanies it. (1) The fashion of the Hats à l'Androsmane has still not been varied, and a very-great quantity of them are still charged from M. Donnet, Merchant Hatmaker, rue Saint Honoré, near that of l'Echelle.